–56 pages full color laminated comic book to be ship to you starting 26th october. – Optional: Signatures by Kern, Kite and (if available at the time) Starlitdragon. – Optional: Custom envelope arts of your favourite Drowtales character with your name. Specify the character and any other details in the special instruction field or “note to merchant”. This is done for an additional fee and we provide no garantee over possible postal damage. If you do not trust the postal services, you may request for your custom character art to be drawn on a seperate bristol sheet. -2.5$ for canada. 1 to 3 business day for delivery. -3.6$ for usa. 3 to 10 business day for delivery. -7$/4.75€ for international destinations. 3 to 14 days business day for delivery. Express tracked shipping is available only for canada. Shipment schedule : Weekly. Every friday except for the initial 26th october launch. Through a shop: Chapter 1 is available in some the shops. Visit the updated shop page to make your order. This is an old news post. Will other chapters be made available? Answer: Yes, one at a time. Each new chapter will come if the previous chapters sold enough to justify printing new ones. I have a comic shop and I’d like to support Drowtales. Can I sell some copies in my shop? Answer: The printed books comes with ISNB so yes it can be sold and distributed. Contact Kern@drowtales.com and write how many copies you would like to buy. We will give you a discount with bulk orders. Will there be tracking number? How will I know when my book is sent? Answer: No tracking number, sorry. We will contact you at your paypal email address or at the email address you provided us when your copy is sent. Also a confirmation of your order will be sent within 24 hours. For bulk order, we can arrange a tracking number if you live on the north american continent. Can you ship my copy with a prologue book? Answer: Yes, but you will not save anything on the shipping. The prologue book weighs exactly 199 grams. After 200 grams, the shipping cost doubles. This is why bulk orders start at 3 copies. What’s the quality of the book? Who is your printer? Answer: We used Transcontinental printing services for a thick, glossy 120m paper interior, with a laminated 200m cover and high quality binding. Answer: You can pay via snail mail or interac. But we cannot garantee your copy until we receive your payment. This payment option is available only to canadians. Interac is also another solution, however only RBC, Bank of Montreal, Scotia bank, Canada trust, and CIBC are supported. To send the transfer, you will need to use my email address “Kern@drowtales.com” as recipient and then forward me the secret password. Ooh, neat. But I take it this means it won’t be available freely on the site like the other chapters, or? Oh, what sort of specifics can we request for the envelope art? Durlyn : You can request a specific drowtales character and what name he or she says. How much extra would it cost if… say… I wanted a chibi Waessoloth on bristol board? And would shipping be extra for that, or would it just come in the same envelope or package as the book itself? Absolute stunning. Just like the remakes of the old chapters – they’ve breathed new life and colour into the story. Now excuse me while I read it a third time…. the reguested char you can get drawn can that char come from ptp? I just made the order and anxiously await the confirmation email! Thanks for redoing Chapter 1, DrowTales Team! I can’t wait to see it! (sorry if this doubleposts) quick question, did you have to redo chapter 2 for printing as well, or will that go out as is when you get to it? Wod’rar: It can be your ptp character but the character need to have been drawn already. We’d use your official design. No text description allowed as the price of the envelope art does not allow for interpretation nor modifications. Yay! I just received my digital copy. Well done, guys, well done. I’m really floored with what you accomplished with the remake. It really exceeded my expectations, which were admittedly quite high given the production quality of recent Drowtales chapters. Just wanted to tell you guys… The new chapter 1 rocks! Especially if you compare it page to page with the old version. It’s nice to see how much Drowtales has improved! How much for both Prologue and Chapter 1 using Bank Transfer? Krizzle: You don’t save any money by combining orders(see faq for explaination). So it’s the same price as buying both of them seperatly. 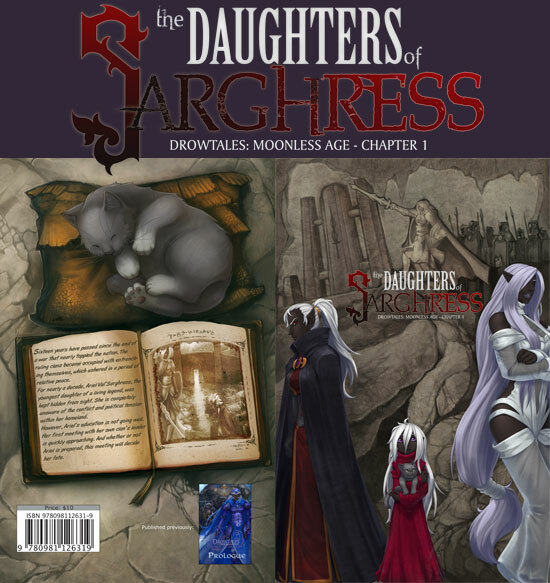 hmm… are you guys going to transfer the art from the new book to the moonless age archive? Yes I have been waiting for this. I wonder if they will start releasing books with mulitpule chapters. Now that wuld be awesome and worth every pennie. Come on guys support drowtales by buying these books.